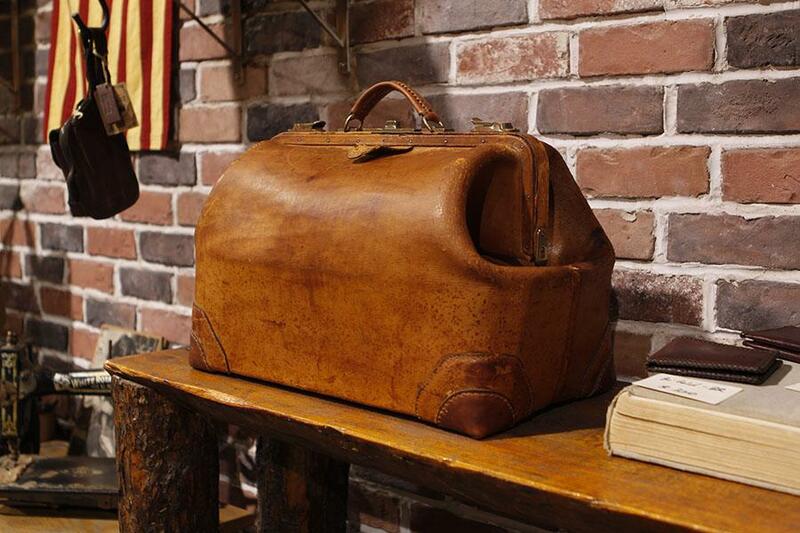 This Vintage leather bag came in for a restoration and it was in a pretty bad shape. It was used as a decoration in the Hayes’ family Study and left to deteriorate. There was a big cut on one of its corner and that handle was a recent addition that needed replacing. Upon receiving the bag, I promptly applied the leather conditioner and protection. Its leather had been so dehydrated, some of its surface was coming apart. After it was cared and treated, we started the restoration process. One of its corner got ripped. Dr.Hayes got the new handle done elsewhere…. but it needed to go. The first order of business was removing the old lining. This bag was clearly very old and it was anyone's guess as to what could've been spilled inside. It had some unpleasant odors and stains making it unsalvageable. So we measured the cut, removed the lining and moved on. Figuring out the best shape to cover the ripped corner. We knew we were going to alter the corner to conceal the tear and to maintain consistency we had to cover all four corners. Of course, if we were going to use our newer leather so these leather pieces had to undergo our Sandast finishing. After making the initial pattern we found out the feet used in this bag weren’t removable. Interestingly, they were connected to the wood frame by nails. So the pattern and leather had to be adjusted. As far as we know, 3D leather sewing machines don't exist so those border holes were specially cut for the hand-stitching needed to apply them. After the new leather corner were applied, the fun really began. Because of the thick layers of cardboard and support, Luis had to use this hand-needle tool from the inside to the exterior, one by one, back and forth for each hole we had punched. It was a repetitious and cumbersome process, which is why we're so thankful to have Luis, a master leathersmith. No machine can do this type of job…. so Luis is doing what he is doing best…. by Hands. After a break, we directed our attention to the handle. Luis is a master at braiding as well. When it comes to leather, there is not a thing Luis can’t do. So after about day and a half working on this bag this is how it looks now. Lined with our signature plaid and a fresh fabric scent. Mrs. Hayes was particularly satisfied with the upgraded handle which perfectly matched the original color and overall elegance. new handle….. matching the color of its body. The beauty was restored in a process we refer to as "Vintage done Right"
Definitely a Restoration Job well done!